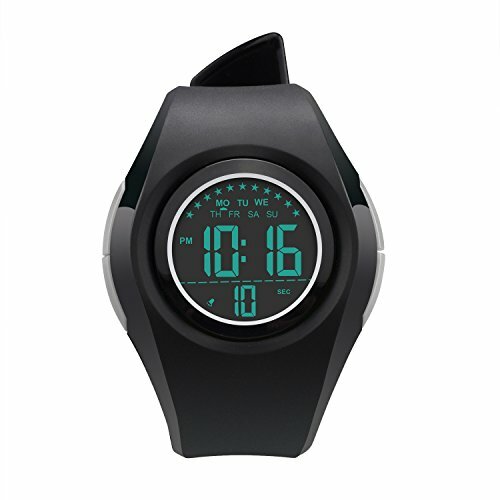 Multi-functional Kid Watch: Digits LCD Display, Display Hour, Minute, Second, Week, Stopwatch, Shock Resistant, Hourly Chime and Daily Alarm, 12H/24H format is changeable, Chronograph with split function, EL back light. Nice kid watch suitable for both boys and girls. Long Battery Life with LED Backlight: Original Movement, provide precise and accurate time keeping. Imported battery which can provide the watch strong power. Kid watch use imported LED Colorful lights, just press the backlight button on the top left, you can clearly see the time at night. Friendly Warning:waterproof children wrist watch,50 Meter Water resistant.Daily Use Waterproof,Can not to wear our digital watch for swimming and diving. Can not be used in hot water, can't wear it in hot bath or sauna.Please DO NOT press any buttons underwater.Too much water contact or usage in extreme Hot or Cold temperature will shorter watch life. Friendly Kid Watch with Shock Resistant : PC material case and Stainless Steel case back which enable the watch to be tough and durable. High quality silicone strap, plus spray handle oil, the strap is soft and comfortable and environmental friendly. Perfect children gift watch for boys and girls.